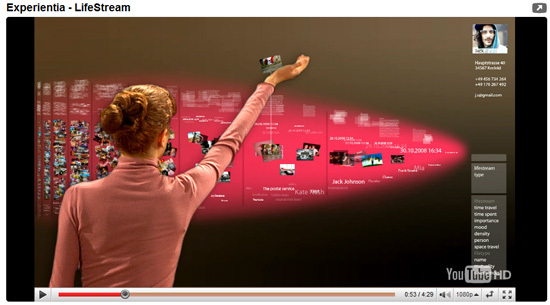 It has become a very common trend to use Minority Report as a reference whenever referring to interactive visualization interfaces. I came across a video that takes this approach and applies it to Lifestreaming. As soon as I started to watch it I knew it looked familiar to me. That’s because I wrote about it a year ago. The video was created by the Vodafone Group’s user experience / concept development group. I decided to repost this not only because it’s a very cool video showing some unique interactive visualizations, but because it was reposted in glorious 1080p HD goodness on YouTube. I’m embedding it below for convenience but I recommend watching it on YouTube and making sure you select the 1080p option and expand its size. Just like when we see concept cars at auto shows, I’m wondering how far out these types of user interfaces are. This is probably the opposite direction that user interfaces will go as our 1st device becomes smaller and smaller, i.e. the cell phone. Imagine having something like this in your house as normal equipment, just like we have telephones today. Well the video does show a mobile interface as well around 3:40 into the video in the section titled Mobile Lens although I do see other forms of the UI making their way into business and personal interfaces in the future as well.